I used to be halfway between Ca Mau and Sai Gon, now I'm just espousing unique schmuck. Accordion3 on Absence Makes Me Wordier! Tanit-Isis on Absence Makes Me Wordier! *Take that, SEO spammers. Wonder what search terms will bring readers to this page! Ha! There are many cut projects in my sewing corner, but a picnic invitation sent me to making a summer dress first. A long time ago, when I was in university, I had this lovely navy with elephants on it shift dress. I threw it on when it was hot, which it was rather often in Brisbane. Eventually, I grew out of it, in both the figurative and the literal sense: it got a bit tight and suddenly seemed too short. I wore it around the house and to sleep in, but rarely out. While meandering around my favourite op shop in Melbourne, I spotted the exact fabric of my shift dress. I was with a cousin, visiting from Sydney, and she remembered the dress, which was a bit of a surprise. We’d had fun reminiscing together about our childhood; she is almost a decade younger than me and I was the leader of our group of cousins in game-making. Shamefully, my clearest memories involving her as a child was how often our games involved leaving her out in some way; e.g. everyone’s secret goal was to run away from her. I was horrid. Thankfully, she remembered the games I made up with pleasure. I was quite the storyteller as a kid, weaving a world around our group of cousins. I hoped that her memories were more accurate than mine, that I made up games and worlds that also included her, and that the games that excluded her were fewer in proportion. I swear, I’ve grown up nice. Honest. The op shop fabric happened to be a sarong. A nice large bit of fabric. I snaffled it up with the intention of making a grown up version of that university dress. All I needed was the right pattern. The right pattern was Pattern 3A from Simple Modern Sewing. A simple, shapeless A-line shift, with no fastenings of any kind and merely some overlapping fabric at the shoulders, as a design detail and to assist getting into and out of the dress. There are only two pieces to this pattern if one chooses (as Oanh did) to leave out the facings. It’s a summer dress! I’m not doing facings for a summer dress! Tchah! Cutting the pattern took no time at all. What took a whole lot longer was fiddling with the pattern pieces itself. Looking at the traced pattern, I knew that the XS would be much too large. So I did some flat pattern fitting. I don’t know if this is kosher, and I’m yet to do any proper fittings and alterations and muslins. Basically, what I do involves measuring myself and measuring the pattern and doing some maths. The hip section of the pattern would have ended up being 4 inches too large either side of MY hips; and the waist would have been 2 inches too wide all around. (My figure is, in effect, a stick with shoulders. Maybe a bit of narrowing at the waist. But only a bit.) I was a bit too nervous to slice into the pattern too much (you know, measure three times and cut once and all that) but I also did not want to make a muslin. 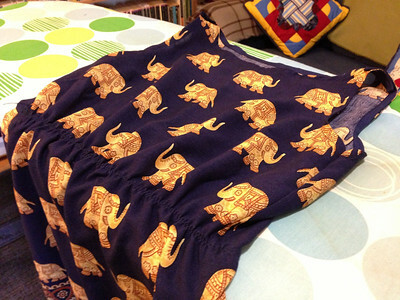 Partially because I am lazy and impatient, and partially because about 1.5 metres of elephant fabric cost me $4. My astute Partner had said, “You buy all your fabric cheap, just cut into it!” It is good advice. I cannot save up all my lovely fabric. Although sometimes I do just open my wardrobe, where I stash my fabric, and just gaze at all with pleasure. In the end, I cut the XS, without seam allowances, and basted the dress. It was unflatteringly much too large. I suspect this will happen of all patterns in the book, but that’s okay. I can work with that. I pinned it in and re-basted until I was happy with the fit. But here’s the awesome part: I then modified my pattern. Yes, everybody, sewing accolades should rain down upon my head. Triumphant wind instruments blasted inspiring notes all around as I modified the pattern in a haze of self congratulation. And in case you missed it on Twitter, this is the successful dress, successfully worn to a most successful picnic. All round, I consider it a success. It was not such a successful photo, however. And, yes, I often stand like I’m ready for a fight. Why do you ask? I added some elastic at the waist too. For the first time, I used bias binding as facing. For those not in the know, this is where a thin strip of fabric (bias binding) is used to finish things like necklines, armholes, waistbands and hems, where facing otherwise is. Facings are those extra bits of fabric used to stabilise those just abovementioned places on garments. I know. I didn’t know this either. See the nifty bias binding facing at the armhole and neckline? It’s awesome. The end. This dress has been so successful, I will be making two more as per Gillian of Crafting a Rainbow‘s #sewing dares. I’ve already started – post to come when they’re done. Hopefully, in time to be worn for summer! I must admit to not being that fussed about elephants until later adulthood. I was a small kid and certain they’d just step on me. Thanks – it is rather cute, isn’t it? I have only just realised what everyone’s talking about when they say that bias tape can be used instead of facing, when I’m facing the facing (!) that I’ve cut out and wondering WTF + thinking I might skip it entirely but knowing I probably can’t. Reading those links you provided (and marvelling at the gorgeous pictures/garments people make) was excellent. Thank you! Google is our friend in this learning game. But why on earth is a pattern telling you to put facing into a kid’s dress? That’s just mean. So glad you enjoy my posts! Oh my, I love this dress! Those elephants are super cute. My mum has that sewing book & I’ve been tempted by some of the patterns in it but I have a similar shape to you & worried that they would look like a sack on me. The waist elastic looks like a definite improvement. Maybe I will give this a go sometime too. And Viv, I reckon the sizes will be much too large on you too, so watch that and don’t get too disheartened by it; taking in is much easier than letting out, I think. There are some great patterns in the book, and it’s excellent for beginners (reallly clear pictorial instructions), so I would definitely recommend! Hehehe – I agree with Tseen Khoo – you crack me up! I love this border print – this simple silhouette is perfect for it! I’m a sucker for border print, too, but never very good on how to design with it. But you are so right: a simple silhouette is the way to go. Flat pattern fitting is kosher! Sometimes taking the plunge and get sewing is the best approach, or you get the rabbit in the headlights problem, with scissors in hand…. Yippee! I’m doing something right! Yes, I belong to the plunge in camp; if I question too much, nothing will ever get made! Congrats on being 1/3 through your sewing dares! And I adore your elephant fabric… Happy picnicking! Thanks! This dress is going to venture to many picnics, methinks, until my picnic compadres get sick of it. Love your “frock” Oanh. How come we didnt see it at Christmas????? I presume it was still in the “material” stage at that time. I think it looks great on you and you should make many more of the same for the awful Melbourne summers! You are right, Helen, it was still in its material form at that stage. I actually wanted to wear the red Tiramisu dress at Christmas, but I felt too unwell to carry it off and just preferred jeans and shirt. This is so cute! And isn’t bias binding amazing?? I will never sew a facing again in my life thanks to this wonderful invention! And I flat-fit my patterns all the time – I hate too much ease so often do so. Glad to hear flat fitting is a done thing! Your progress is amazing, so good to see! I’ve found some patterns in an op shop (charity shop) recently that had the most delightful, but incomprehensible scribble all over. Looks great! I much prefer the modified shape of your elephant dress to the original. Well done! I’ve not yet used bias binding as facing; I’ll have to give that a go some time. Bias binding as facing is great – you won’t look back if you head down that route…. you look fab! I sure do love a bit of op-shop ‘re-purposing’! I just came back from todays post to look at this- oooh, time travel! I’m not sure what tense to write in now! But I love this dress in any time frame. The present tense is still permissible (as I’m still wearing it): thank you! It was with Jungle January in spirit.